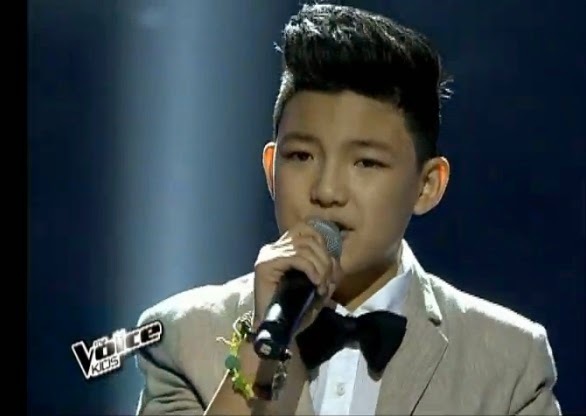 Manila, Philippines - Team Sarah's young artist Darren Espanto sang Justine Biber's song "Somebody to Love" on the grand finals Upbeat Song Round of ABS-CBN's top-rating vocal competition 'The Voice Kids' Philippines on Saturday, July 26, 2014 at the Newport Performing Arts, Theater, Resorts World Manila, Newport City, Pasay City. The 12-year-old kid from Calgary, Alberta is among the Final 4 artists of the competition under Coach Sarah. "Darren forte mo ito eh. Hinog na hinog ka na. Para kang pinaghalong Sir Gary V. at Martin Nievera", Coach Sarah said. WATCH: The Voice Kids Philippines Grand Finale Upbeat Song Round "Somebody To Love" by Darren Espanto (Video). Talk 'N Text subscribers. The tariff is P1.00/vote for ABS-CBN Mobile, P2.50/vote for Globe, TM, Smart and Talk 'N text and P2.00/vote for Sun Cellular subscribers. Note: One vote per artist per SIM per round only. The finale episode on Saturday tops online conversations with '#TheVoiceKidsFinale', 'Total Performer', 'Go Juan Karlos', 'Narito Ako', 'Hi Sarah', 'Spy Girl', 'Call Me Maybe' and 'Standing Ovation' among the trending topics.